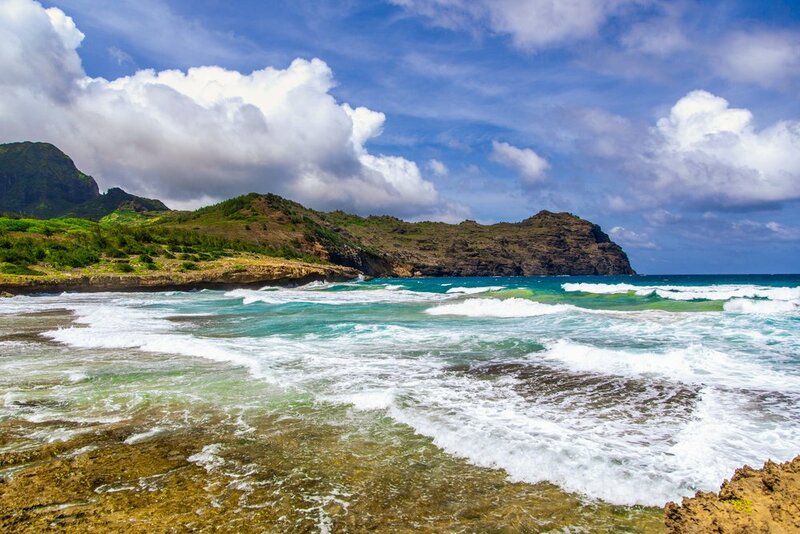 Haula Bay in the Maha'ulepu area on the south shore of Kauai is one the most dynamic and scenic spots on the island. 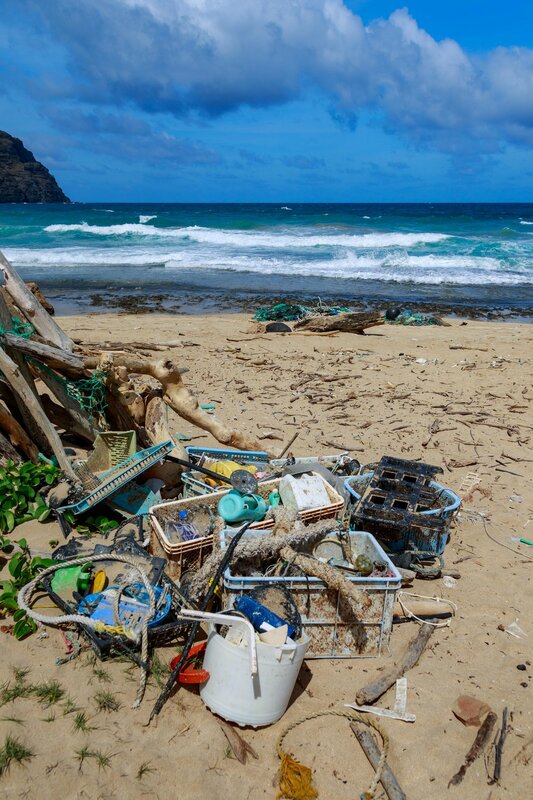 Because it faces directly into the the prevailing northeast trade winds, it is also, unfortunately, a good barometer for the amount of trash in the ocean. Commercial fishing nets and floats, broken long lines, and other by-products of the fishing industry are frequent sights. The ubiquitous plastic junk is always around. The photo shows big plastic trash but does not capture the tiny bits of plastic scattered on the shore. The growing plague of plastic waste in the oceans has been widely documented but the reality hits hard when you repeatedly see it in a setting like this. If you want to really get a view of the problem, get the June 2018 issue of National Geographic magazine. 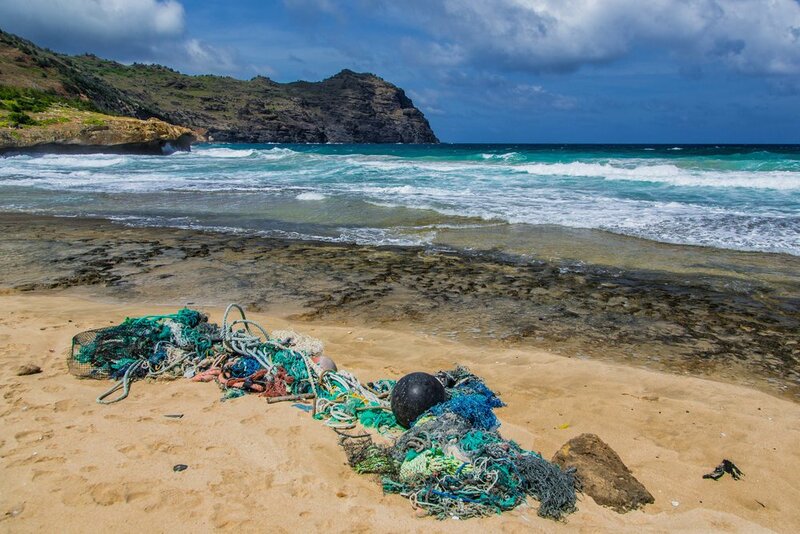 Fortunately, the Surfrider Foundation and other groups and individuals do a great job to keep Kauai's beaches as clean as reasonably possible. Mahalo to all who participate in this never-ending effort. When you live on a small island, the impacts of man-made problems are quickly magnified. This household is trying to reduce our consumption of plastic, especially single-use products and packaging. We favor the food trucks and vendors that use paper instead of the dreaded styrofoam clamshell. We try to consolidate e-commerce activity to avoid excess bubble wrap and packaging. If you are a guest, we have plenty of re-usable water bottles - please don't buy that "flat" of water at Costco! And, hey Costco, can you do something about some of those "club packs" clad in over a square foot of nearly impenetrable plastic and cardboard? Black plastic containers are also a curse as they are difficult to recycle here. More and more, our buying decisions are being influenced by the kind and amount of packaging around a product. So, even if you live a thousand miles from an ocean, I hope that you might think about your individual and household waste streams and consider ways to radically reduce needless harmful junk that can seep into the earth's ecosystems. If you are an entrepreneur and can focus your talents and energy on real solutions to the growing plastic mess, I and many others would gladly invest in you! The world's oceans need help and even the smallest individual effort can start to make a difference. No matter how you think about climate change - human-influenced or a natural cycle - the reality seems to be that events are occurring that no one has experienced previously or even thought about as real and present dangers. Whether a killer fire that sweeps into Santa Rosa, California in the middle of the night or 49 inches of rain in 24 hours, it feels like severe weather events are becoming more of a norm. Even in the short 3 years we have been full time Kauai residents, we have seen shifting weather patterns. The impacts are magnified on a small remote island. 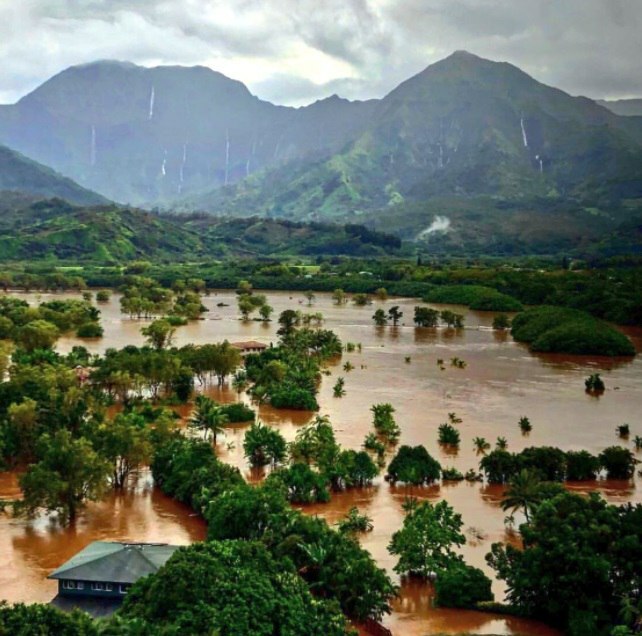 The strong community on Kauai can recover from this mess but if extreme rainfall becomes a regular event, all bets are off. When we first arrived here on the southwest corner of Kauai, a nighttime attraction was watching the full moon rise over the ocean or hills. After a couple of months, I realized the magic of being in a really really dark place. Seeing the moon is great but the moonless weeks are fantastic. By dark I mean so dark that on a moonless night you can’t see your feet! Trying to walk an unfamiliar route without a flashlight is near impossible. I had not experienced that kind of natural darkness before. At first I was amazed by all the stars visible to the naked eye. Then one night I realized that the high band of cloud I kept seeing was the Milky Way! Not clouds - stars! While the Milky Way can be seen all year, it blooms from June through September. Arcing across the sky, it is a spectacular and humbling sight. In a June 2016 article (link) National Geographic reported that light pollution has blotted out the Milky Way for 80% of Americans. Even in this remote location, I fear more light incursion. I was happy to see the county change the ugly sodium vapor streetlights over to downward-directed LEDs - but even LEDs create problems. Meanwhile, I learned to use the camera to capture way more of the heavens than the unaided eye can see. You can view some of those images in the The Sky gallery on this site. I hope these inspire you to seek out a dark place where you experience the night as nature intended. There are many guidebooks for Kauai and the other islands. Many are good; some not so good. 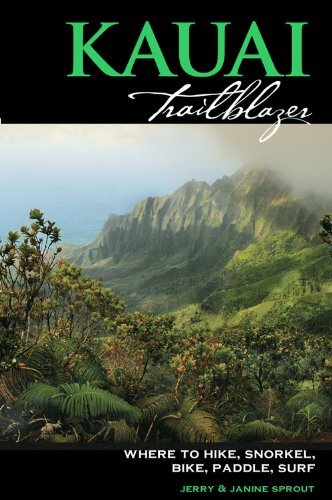 My favorite is Kauai Trailblazer: Where to Hike, Snorkel, Bike, Paddle, Surf. It is available in softcover and e-book at Amazon. The e-book is a little more up to date, with more pictures. I refer to both versions frequently. The book is well organized, directions are precise, and descriptions are accurate. That means pay attention to advice about risks or cautions! Kauai is a great place for outdoor activity but you can get in trouble fast without adequate information or preparation. This book gets you prepared. The book is especially recommended if you plan to extensively hike the island. Starting 2018 with a resolution to post to this blog at least weekly. Subjects will be random ranging from tips about visiting the Garden Island to photography tips to random thoughts or observations. OK, if you are visiting Kauai for a week or more, I recommend this map. It packs a lot of information front and back. The freebie map from Hawaiian Airlines at the airport is OK, but this is way better. Get it online at https://www.envdhawaii.com/product/kauai-island-atlas-maps/ or look for it in stores around the island. For sure it is available at Kauai Photo Tours in central Kapa'a. GPS on a phone is great but having a good map with nice visuals and comprehensive information is a good tool. I refer to this map frequently . . . . .